If you're tired of the same old boring store bought ice cream sandwiches, you might want to create something special to curb your sweet tooth. Try a making them yourself; you won't be sorry you did after tasting your new mouth-watering creation. Take your traditional mint ice cream to another level with a richer chocolate flavor and crunchy chip texture. 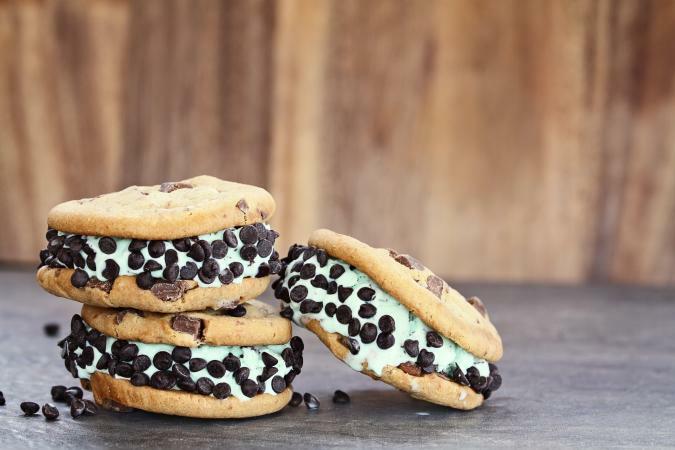 You can't go wrong when choosing this triple chocolate chip mint ice cream sandwich, as everyone you make it for will fall in love. Mix together flour, salt, and baking soda in a large bowl. Beat in brown sugar, granulated sugar, and butter for about 3 minutes (on medium speed) until mixture is light and fluffy. Beat in dry ingredients a little at a time (using low speed) until just blended. Stir in 1 cup of mint chocolate chips. Cover bowl containing dough mixture, and chill in the refrigerator for at least 30 minutes. Form cookie dough into 2-inch balls and place on a cookie sheet. Bake about 15 minutes, or until edges of cookies are golden brown. Let ice cream sit at room temperature for 5 minutes to soften. Put mini chocolate chips in a bowl and set aside. Place ice cream (about 1/2 cup for each cookie) between two cookies to make a sandwich, and press together. Roll sandwich in mini chocolate chips. Serve immediately or wrap individually and store in the freezer until ready to eat! The classic chocolate and vanilla combination can't be beat. Making the chocolate cookie portion and using French vanilla ice cream will take it to the next level. Sift cocoa and flour together and set aside. Beat sugar, salt, and butter together in a large bowl until mixture is light and fluffy. Add vanilla and egg yolks and continue mixing. Gradually stir in dry ingredients and mix well. Roll dough until flat (1/4 inches thick) on a lightly floured surface. Using a 2-inch circle cookie cutter, cut dough into 40 cookies. Place cookie dough on cookie sheets. Bake for about 15 minutes, or until cookies start to become firm. 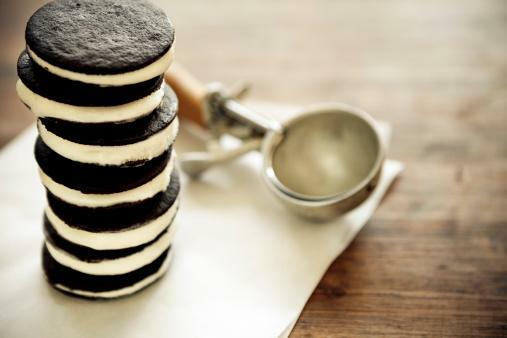 Place softened ice cream between cookies (1/8 cup to 1/4 cup of ice cream between each cookie). Enjoy right away, or freeze individually wrapped sandwiches for serving later. You can buy ice cream sandwiches ready-made, but preparing your own can be a fun experience for you and your kids. It tastes just as delicious (probably more so) than the store bought kind.